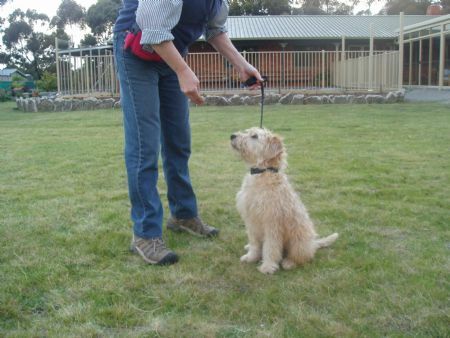 Training your Soft Coated Wheaten should be fun! Leo's story is very special please look at his page. The first 6-9 months of your dogs life is a one-off opportunity to train and especially socialise your pup. There are a lots of wonderful books and trainers out there but there is also some out dated thinking, such as dominance theory and the use of check chains that can create problems, so please choose trainers and training methods carefully and use only true positive reinforcement methods. Whilst you can certainly train older dogs and still have fun doing so, it will take a little more time and effort and the socialisation opportunities will never be there again. Dog training theory did a huge leap forward in the late 1990's. We now know pups are learning and being trained from the day they are born so don't follow the old thinking that you should wait until 6 months to train you pups. Fun, positive ways to train mean your new Wheaten should be learning good manners (and tricks too) from the day they come to you. This CASI program is a Canadian based and internationally respected program of study which I chose to compliment the learning when I studied 5/6 of a Behavioural Science degree. In reality its dog behaviour focus and was of much more value than the undergraduate degree.